Some of the victors come as no surprise. Zoosk is well known and well respected in the industry, as are Coffee Meets Bagel and Bumble. The other names are less familiar. Let’s get to know them. In Clueless, Dateless, Loveless, doctors Khalid Khan and Sameer Chaudhry turn their scientific paper into an easy-to-read guide to the often mystifying process of finding a romantic partner online. The duo present their findings from more than 100 studies on the art of attraction and persuasion in jargon-free language that anyone can understand. JSwipe is the dating app being called the Jewish answer to Tinder. It uses the same interface that’s now familiar to all mobile daters: swipe right for yes, swipe left for no, and no communication can occur unless both users indicate interest. Unlike Tinder, however, JSwipe puts religious info like Jewish sect and kosher preferences front and center. Francesca Hogi is a corporate lawyer turned movie producer turned Survivor contestant turned - finally - dating expert. She’s now a matchmaker, coach, and regular guest on The Today Show. Agape Match is a matchmaking service run by fourth generation matchmaker Maria Avgitidis. Agape’s clients are primarily busy professionals who value privacy and efficiency, and have run into obstacles when trying online dating. Perhaps the most interesting winner of 2016 is the company that scored the coveted Best Dating App of the year award: Squad. The app, in a nutshell, allows you to select a few friends to join your squad, pick another squad that looks interesting, and all go out together. Maybe sparks will fly, maybe they won’t, but either way, you’ll have your friends in tow to ensure the night isn’t a total dud. 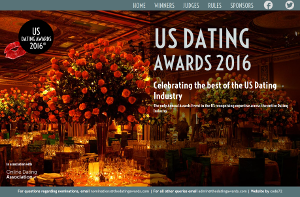 View the full list of US Dating Awards winners here. Other big dating awards includes the Dating Sites Reviews Choice Awards which happens in the new year.